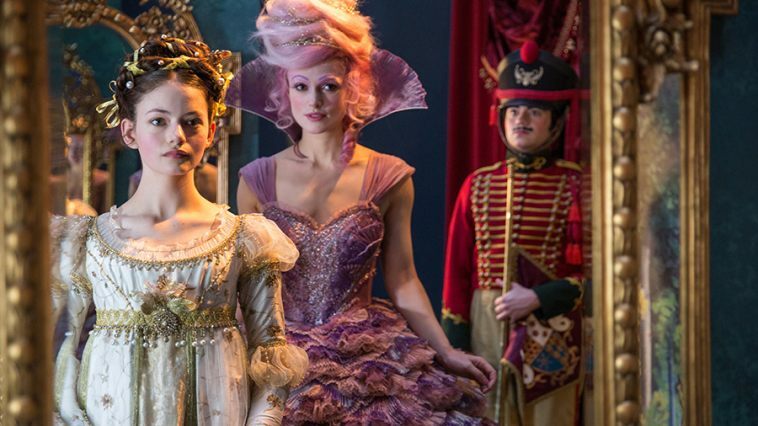 The Nutcracker and the Four Realms Review | A kind of nightmare. "To quote an old Simpsons line, it’s “too crazy for Boys Town, and too much of a boy for Crazytown.”"
"It’s the rare time at the movies where you long for something to be more two dimensional." Let’s face it. Unless you’re a seven-year-old, a ballet fan, or both, what you want to know about The Nutcracker and the Four Realms is whether someone at Disney dosed the drinks in the writer’s room with acid. Is this really a movie that takes the Tchaikovsky-scored ballet as a jumping off point for a through-the-wardrobe style adventure, involving writhing masses of mice that combine to make a creature with arms and legs, and a four-storey metal queenmobile that functions as some kind of steampunk nightmare? Yes and no, because that makes it sound a lot more interesting than it is. 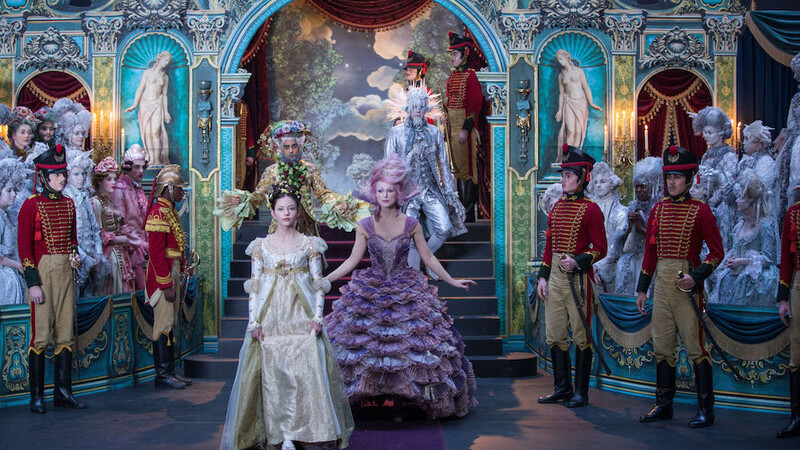 There are some goofy ideas and visualisations of those ideas in The Nutcracker and the Four Realms, and some of them are good, but they are born out of a failed endeavour to appeal to as many audiences as possible more than any kind of pioneering creative spirit. Lest we forget, it’s also a Christmas movie. The premise involves a plucky young, scientifically minded girl (is there any other kind?) named Clara, who has recently lost her mother. That’s actress Mackenzie Foy, and this appears to be 19th century London. It’s Christmastime, and she’s given a present by her grieving father that her terminally ill mother instructed to be delivered on Christmas Eve. It’s an ornate egg requiring a mysterious key to open – a mysterious key that is also missing. The note from her mother claims that everything she needs can be found inside. 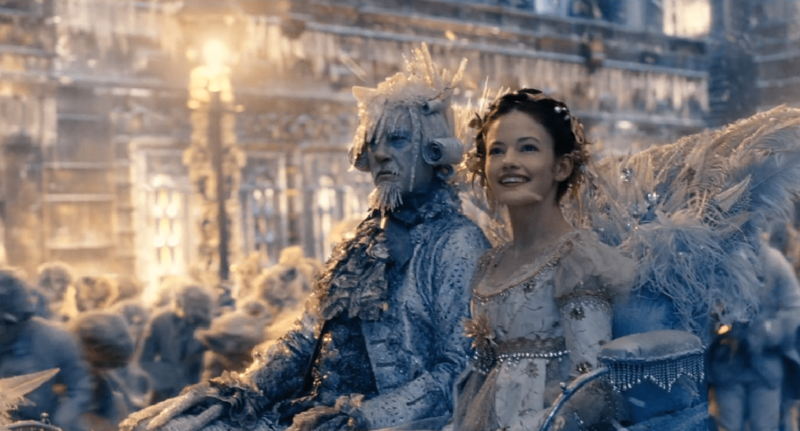 The search for that key takes her into a snow-covered land called the Four Realms, which is guarded by nutcracker soldiers, and populated by the colourful subjects of a handful of regents – played by Knightley in addition to Eugenio Derbez and Richard E. Grant. Clara befriends Captain Hoffman (Jayden Fowora-Knight) to help navigate her new enivrons. Someone else wants the key: Mother Ginger (Helen Mirren). She travels around in the aforementioned metal monstrosity whose first appearance constitutes one of a regrettably small number of times you think Disney has made something truly edgy, has indulged in someone’s idiosyncratic vision rather than the end product of a committee. Mother Ginger has some interesting creatures at her disposal, be they armies of mice or contingents of circus clowns adept at hand-to-hand combat. The future of the Four Realms hangs in the balance. Most if not all of these concepts are inspired by some aspect of the traditional stagings of The Nutcracker, which is probably why the movie never steps beyond the border between the conventional and the unconventional. The rest of the design details have obvious inspirations elsewhere in our culture. The four realms might as well be Narnia, Oz, Wonderland and, I don’t know, Panem (thinking only of the weird hairstyles for that last one). As the cinematic landscape is already choked with stories where people pass through a wardrobe, literally or otherwise, to another world, the bar is pretty high to stimulate our sense of wonder if you are trying to add to that collection of worlds. Suffice it to say, the makers of The Nutcracker and the Four Realms do not clear that bar. And Disney probably knew that might be the case when installing directors like Lasse Hallström and Joe Johnston. Each director has had his undeniable hits, but Hallstrom has never really improved on the days when he was still filming in Swedish (My Life as a Dog comes to mind), and Johnston’s had more Jurassic Park III’s than Captain: America The First Avengers in his career. (Those titles were not meant to be pluralised.) Point is, both directors have descended into that phase where they are solid craftsmen with little vision. These results demonstrate that amply. At least there are a couple actresses really having fun. Mirren’s got a great scar etched into her face, and she relishes the opportunity to go a bit big here. But not like Knightley. Knightley puts on a squeaky voice to go with that pink hair and the fairy wings that sprout out of her back, and she puts it to great use as the story reveals more about her and what she wants. (Spoiler alert: she may not be what she seems.) The bland performances by the other actors – including a cameo from Morgan Freeman, looking like an octogenarian Rastafarian – sorely need the playful approaches of Mirren and Knightley. There’s some ballet here too. Those scenes impress not only for their choreography, but for the use of the two-dimensional sets you’d see if you were actually attending a performance of The Nutcracker. It’s the rare time at the movies where you long for something to be more two dimensional.